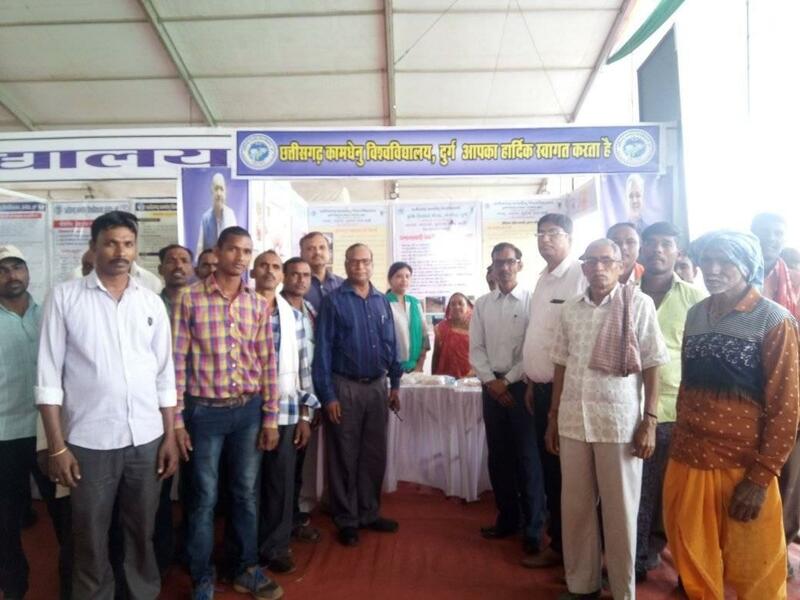 KVK Anjora Durg participated in Krishi Vikas & Krishi Kalyan Mela 2019 related to Naruwa, Ghuruwa, Garwa, Badi at Krishi Upaj Mandi Bemetara during 22-25 feb 2019. ♦ SAC Meeting organised on 24.08.2018 at KVK Anjora-Durg(C.G.). Hon'ble Vice Chancellor of CGKV Durg was the chief guest of the programme. 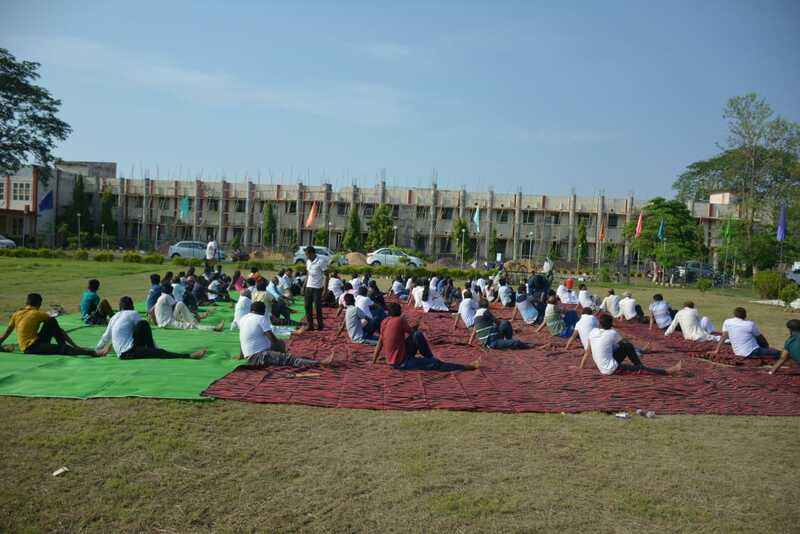 ♦ International Yoga Day celebrated at College campus of Veterinary Science and Animal Husbandry, CGKV, Durg on dated 21.06.2018 . 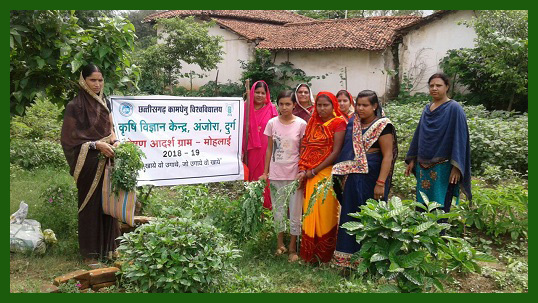 ♦ "World Soil Health Day" celebrated at KVK Anjora-Durg(C.G.) on dated 5.12.2017 . ♦ "Sankalp se Siddhi New India Manthan 2017-2022" programme organized at KVK Anjora-Durg(C.G.) on dated 23.08.2017 . ♦ "Six days training on Spawn production and Mushroom cultivation conducted from 19.07.2017 to 24.07.2017 at KVK Anjora-Durg(C.G.)" . ♦ "SAC Meeting organized at KVK Durg on 3.06.2017. 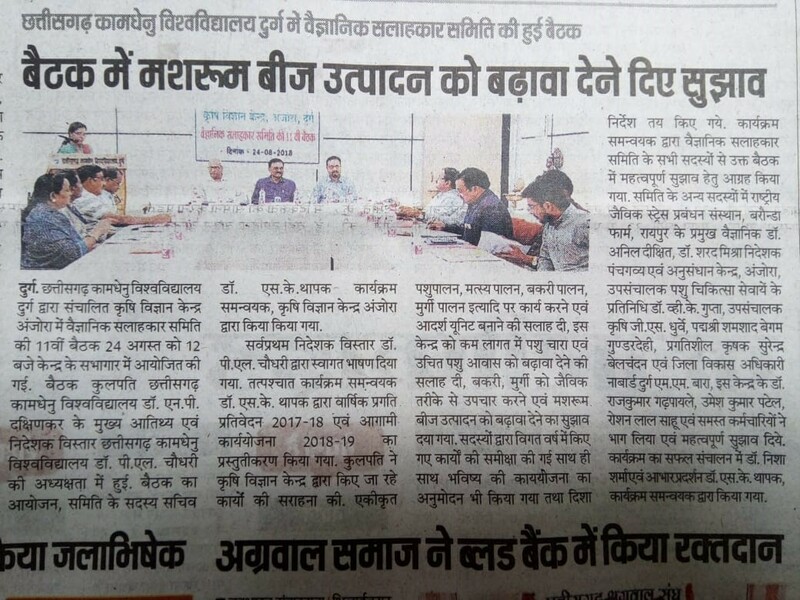 Hon'ble Vice Chancellor of CGKV Durg Dr.Prof. U.K. Mishra was the Chief guest of the event. Based on the recommendation of the Education Commission(1964-66), consideration/review by the Planning Commission and Inter-Ministerial Committee, and further recommendation by the committee headed by Dr. Mohan Singh Mehta appointed by ICAR in 1973 the idea of establishment of Farm Science Centre (Krishi Vigyan Kendra) was evolved. The first KVK, on a pilot basis, was established in 1974 at Pondicherry under the administrative control of the Tamil Nadu Agriculture University, Coimbatore. At present there are more than 610 KVKs established in the country. 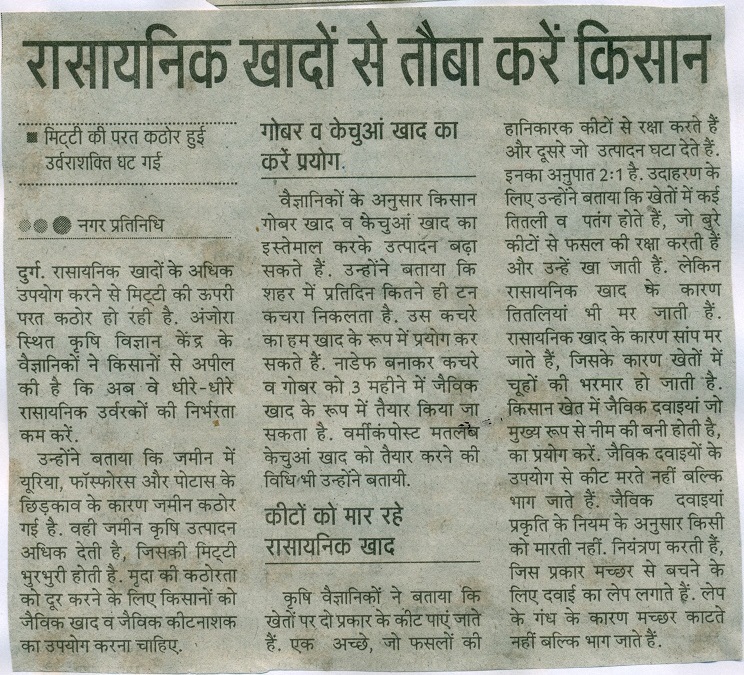 KVK project was started with an object of delivering latest agricultural technology to the farmers. The main object of this project is to deliver the latest technical knowledge to the farmers and it is based on the law of learning through observing work experience and by doing itself. Krishi Vigyan Kendra, Durg was sanctioned vide letter no. 3-2/E/KVK/Dt.01/05/1992 and established in October, 1993, under Indira Gandhi Krishi Vishwavidyalaya, Raipur. 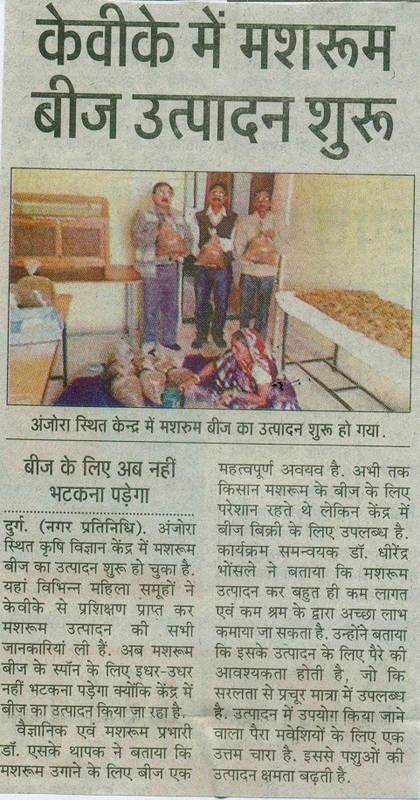 Krishi Vigyan Kendra Anjora,Durg,(C.G.) is transferred under the administrative Control of Chhattisgarh Kamdhenu Vishwavidyalaya on 18.09.2014 with all the assets liabilities and setup consequent upon approval of Indian Council of Agricultural Research New Delhi and Decision taken by Government of Chhattisgarh . Honorable Vice Chancellor is Dr N.P. Dakshinkar and Director of Extension Service is Dr. P.L. Choudhary. Compiling all relevant recommendations/package of practices for their meaningful utilization in the training courses and the follow-up extension programmes. Planning and conducting need-based production oriented short and long duration training courses for various target groups. Imparting vocational training to unemployed rural youth and school dropouts on the principle of learning by during and Seeing is believing. Organizing farm science club in the adopted village and rural schools. Developing and maintaining the instructional farm and demonstration units on scientific lines. Demonstration of the technologies tested and recommended for location specific situations to find out their potentiality and profitability. Conducting on farm testing of the technologies developed by Agricultural University and ICAR research institutes for their local suitability and identification of constraints. On farm testing to identify the loaction specificity of technologies in various farming systems. Frontline demonstration to establish production potentials of newly released technologies on farners' fields and provide feed back. Create awareness about frontier technologies through large number of extension activities like Farner fair, Field day, Strategic campaign, Ex-trainees meet, etc. 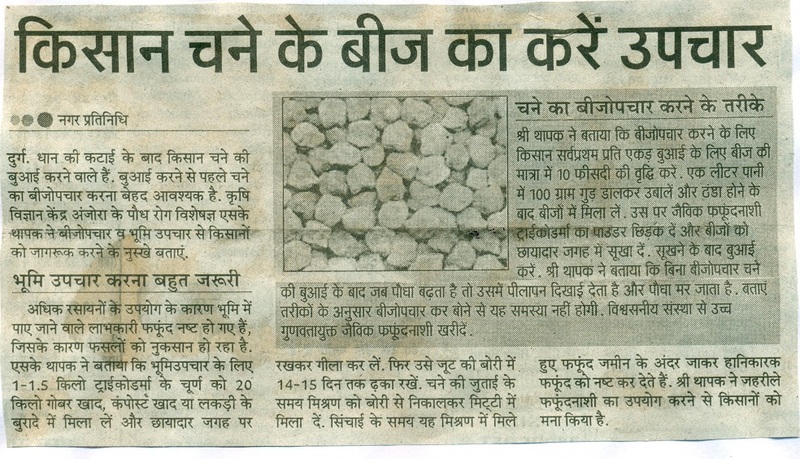 The seed and planting materials produce by the KVKs also be made available to the farmers. 2. Collaborate with the State Agricultural University, the state extension personnel in "On-farming testing", refining and documenting the technologies for developing region specific sustainable land use systems. 2.Frontline demonstrations to establish production potentials of newly released technologies on farmers' fields and provide feedback. 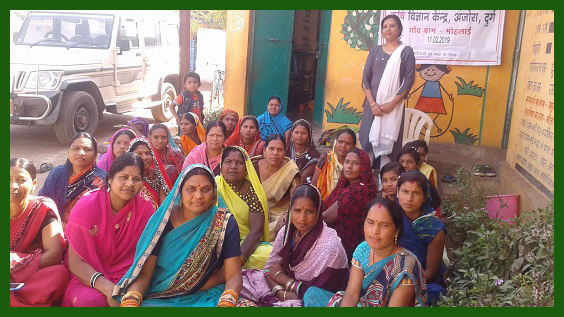 3.Training of farmers and farmwomen to update their knowledge and skills in modern agricultural technologies and training of extension personnel to orient them in the frontier areas of technology development. 4.Work as resources and knowledge centre of agricultural technology for supporting initiatives of public, private and voluntary sector for improving the agricultural economy of the district. 5.Create awareness about frontier technologies through large number of extension activities like Farmer fair, Field day, Strategic campaign, Ex-trainees meet, etc. 6.The seed and planting materials produce by the KVKs also be made available to the farmers.